Lightgliders: Pirates Party on Thursday! Ahoy buckos! Norman Snowflake Cook reporting from the high seas with the Red Party Gliddle to invite you all to our Pirates of the Academy Party! In honor of "Talk like a Pirate Day", we are all dressing up in our best Pirate gear to help get us ready! This party will take place in the Library where we will meet new mates, climb the Crow's Nest, and look for buried treasure! Make sure to be there this Thursday at 5:30pm EST/4:30pm CST. 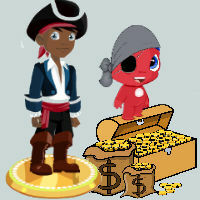 Just do your Gliddle Challenge of the Day and you will receive an awesome Pirate Outfit! Hey Lightglider, sorry to hear that, we are looking into the problem. In the mean time, try exiting your web browser and restarting with a fresh page to visit www.lightgliders.com. We hope to see you at the party on Thursday!